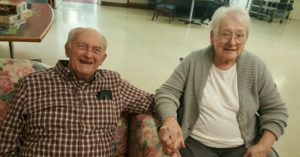 Ruby (Shultz) Smith, 87, of Manchester, Ohio passed away on Sunday, March 24, 2019 at the Locust Ridge Nursing Home in Williamsburg, Ohio. She was born November 21, 1931 in Chillicothe, Ohio. Ruby was preceded in death by her parents, Charles and Edna (Barker) Shultz, husband, Harry Smith, and 8 brothers and sisters. Ruby is survived by her children: Timothy (Yolanda) Smith of Manchester, Kathy (Mark) Amon of Seaman, Ohio, Cheryl (Mike) Smitson of Manchester, and Melinda (Bill) Jones of Georgetown, Ohio; brother, Carl Shultz of Peebles, Ohio; 11 grandchildren; 26 great grandchildren, and many nieces and nephews. Ruby attended the Manchester Nazarene Church and the Hickory Ridge Church as long as her health permitted. The visitation is from 11 am – 12 pm Thursday, March 28, 2019 at the Lafferty Funeral Home in West Union. The funeral will follow at 12 pm with Chaplain Bonnie Bohn officiating. Burial will be at the Hickory Ridge Cemetery in Huntington Township in Brown County. I always admired her. My deepest sympathies for your loss. I will miss you Aunt Ruby. You were always kind, and one of the hardest working ladies I've ever known. Prayers and hugs to the family. Ruby was a very sweet and kind woman..She will be missed..
My thoughts are with the family I absolutely adored Ruby she was such a get to the punch lady and always very sweet to me! So sorry for your loss. Prayers for all of you. Sending my deepest condolences to the family.